Four weeks after heavy fighting in the town forced the organization to stop working, MSF has resumed its medical activities in Walikale. 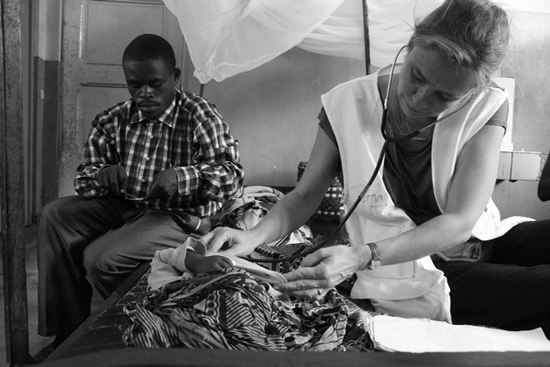 An MSF staff member examines a young patient in Walikale. WALIKALE, DEMOCRATIC REPUBLIC OF CONGO, AUGUST 17, 2012—The independent humanitarian organization Doctors Without Borders/Médecins Sans Frontières (MSF), has resumed its medical activities in Walikale, four weeks after heavy fighting in the town forced the organization to stop working. “We’re glad to be back providing free medical care,” said Colette Kerr, a nurse heading MSF’s team in Walikale, a town in the North Kivu province of the Democratic Republic of Congo (DRC). Before the suspension, MSF teams were treating over a thousand cases of malaria each week in an emergency program set up specifically to address an outbreak of the deadly disease. But last month when the sound of gunfire began, people panicked and left town. Her 4-year-old daughter became sick a week later and is currently hospitalized with severe malaria and anemia. If left untreated, severe malaria causes organ damage and leads to death. “There are still many other children in the forest who are sick, many with malaria, but they have no way to come here for treatment,” said the mother of another child also hospitalized and under MSF’s care. People in and around Walikale remain severely affected by the ongoing conflict, continually forced to leave their homes in desperate search of safety. Such persistent displacement increases susceptibility to endemic diseases such as malaria.